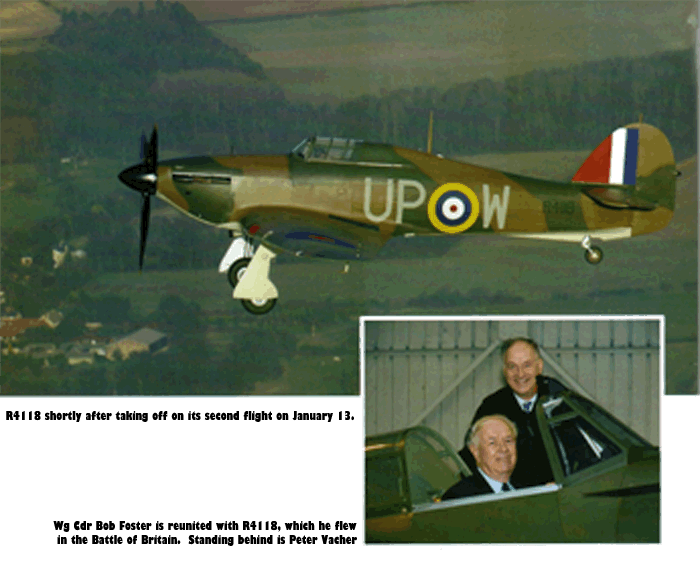 There was a wonderful early Christmas present for Peter and Polly Vacher on December 23, 2004, when their superb Battle of Britain veteran Hawker Hurricane I R4118 (G-HUPW) returned to the air for the first time in over 60 years. This first test flight was carried out from Marshall Aerospace a Cambridge Airport, with Pete Kynsey at the controls, and lasted for just over 20 minutes. The Hurricane was reported to have flown beautifully, and no major ‘snags’ occurred. A second test flight took place at 14:30 on January 13, this time in the hands of Stuart Goldspink. Despite some initial difficulty in raising the undercarriage, this was soon sorted out and another successful flight of just over 20 minutes was carried out. A third flight was planned for 14:30 but while going through the checks, Andy Sephton, the pilot for this sortie, encountered a mag drop problem and so did not get aloft. A total requirement of about five hours of test flying was anticipated, and it was hoped all this would be completed sometime during early February. 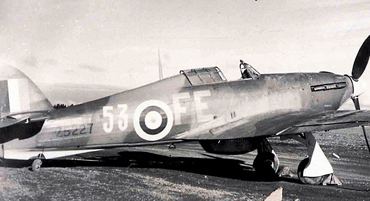 R4118 was delivered new to 605 (County of Warwick) Squadron at Drem, Scotland, on August 17, 1940. A few weeks later, on September 6, the squadron moved south to Croydon, Surrey. A refuelling stop was made at Abingdon, with the Hurricanes making night landings at Croydon as the Blitz raged in London. 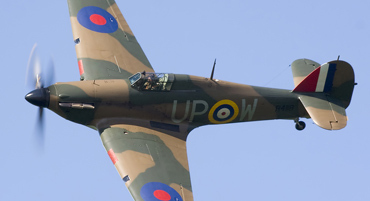 During the Battle of Britain R4118 flew some 49 combat sorties from Croydon and shot down a number of enemy aircraft. Following heavy battle-damage on October 22, it was sent away for rebuild. It then made a return to Scotland, being next taken on charge by 111 Squadron at Dyce on January 18, 9141. There it was soon flying patrols over the North Sea and back in combat. During R4118’s subsequent service it was used primarily as a training aircraft and was rebuilt a further there times following major accidents. In December 1943, the Hurricane was crated at Cardiff and shipped to India as a training aircraft. As things turned out, it was never needed and remained in its box in Bombay until 1947 when it was struck off charge. It was then donated to a university as an instructional airframe for engineering students. The fuselage was placed outside in a compound, with the propeller, wings and tailplane lying on the ground. The aircraft remained like this until June 2001, when around six years of complex negotiations were at last concluded and it was loaded into a container for shipment to the UK. 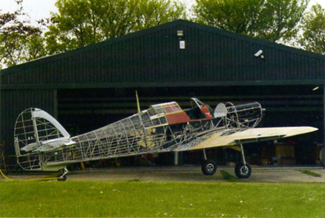 Peter Vacher had discovered the airframe by chance in 1982, though he did not offer to buy it until 1996. 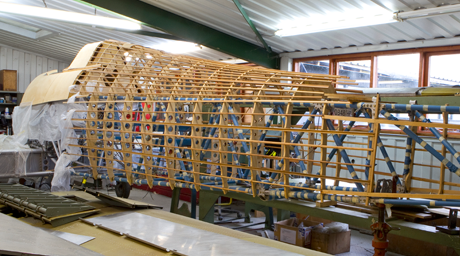 Suffolk-based Hawker Restorations then undertook a meticulous restoration of the airframe, which took around three years to complete. 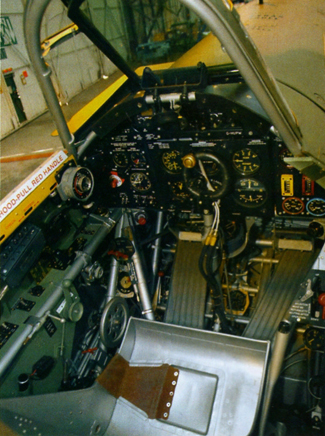 The fighter is fitted with a Rolls-Royce Merlin III, rebuilt by Maurice Hammond’s Eye Tech Engineering. The fabric work and highly authentic repaint was completed by Clive Denney and his team at vintage Fabrics. this code preceded by ‘H’ for Hurricane). The level of workmanship that has gone into this aircraft can be measured by the fact that it has working identification friend or foe (IFF), a functioning gun camera (which will be fitted with 16mm film) and the original guns – although, of course, deactivated, they do still click when ‘fired’. It is also fitted with its original radio equipment. 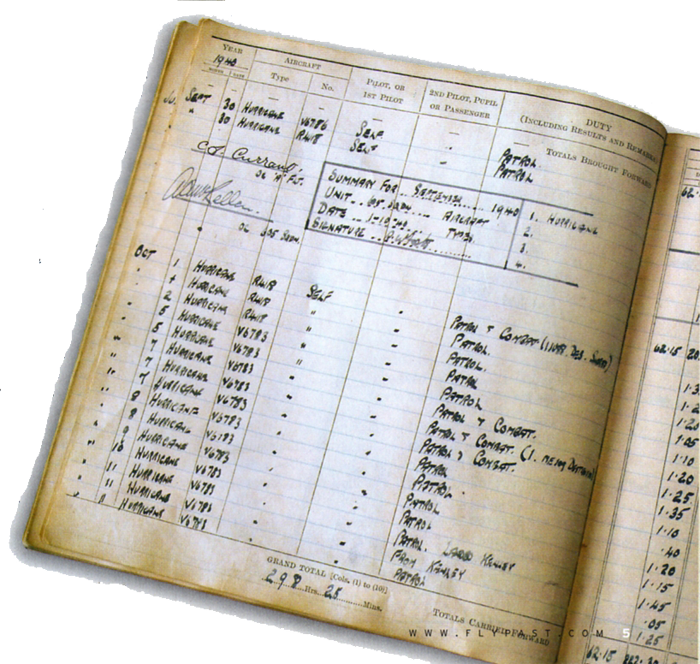 After Peter found the aircraft in India and discovered its identity, he went to the Public Records Office and searched through the relevant data to identify the pilots who had flown it. Since then, he has located a number of R4118’s wartime pilots and their families; three former pilots are still alive. There to witness R4118’s second test flight was Wg Cdr Bob Foster DFC, who flew this particular Hurricane on several combat sorties during the Battle of Britain. Bob’s first flight in R4118 was on September 28, 1940, when he flew four patrols in this aircraft. He claimed one Junkers Ju 88 damaged over Beachy Head in the afternoon. His next flight in the aircraft was two days later on September 30. The on October 1, on the first of two sorties in R4118 Bob got a shared Ju 88 ‘kill’ with two other 605 Squadron pilots. Being reunited with this machine and watching it fly again was a heart-warming experience for him. Due for publication in May by Grub Street Publishing is Peter Vacher’s 192-page hardback book ‘Hurricane R4118’ (£20, ISBN 1904943 07 1), which documents the amazing storey of the discovery and restoration of this rare Battle of Britain survivor, complemented by photographs throughout.